In a perfect world, there would be one universal welding machine that would allow any welding operator at any skill level to handle every type of welding job on any type of materials imaginable. The difficulty is that there are so many types of welding jobs and materials, so it requires a different type of welding process to accomplish it. However, there are some machines that will let you perform at least two types of welding process. We’ll take a look at a few of those here. By Gregory Sanders: This article has been updated to reflect the most accurate information regarding best multi process welders available for those who are interested in welding. The best 5 available have changed, and information has been added to assist individuals in finding the best multi process welders currently available on the market. The FAQ has also been updated. This is a compact starter multi-purpose welder. 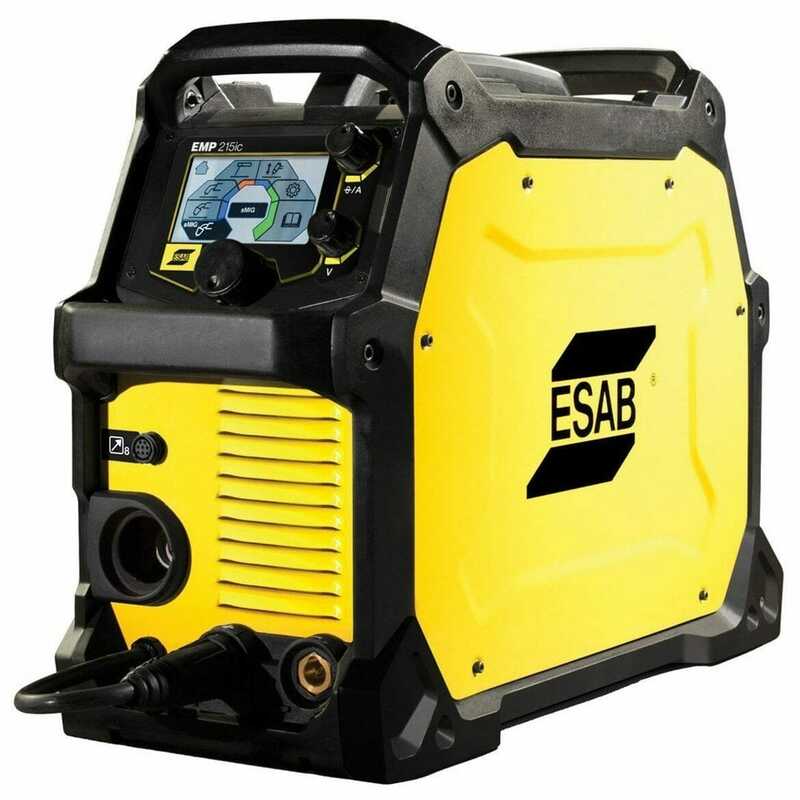 The ESAB Rebel EMP 216ic is a 3-in-1 multi-process machine capable of doing MIG, flux core, stick or TIG welding. It weighs 55 pounds. Output is DC and ranges up to 200 amps. The machine can run on 110 or 230 volts. This welder is an affordable choice for the beginning welder or one looking for a nice multi-process machine that can do light welding jobs. The unique roll-cage industrial design boasts 5 handles making this a highly portable unit. It comes with a TIG torch and regulator included - most multi-process machines do not. Both the MIG arc and the TIG lift arc are smooth and steady making for a reliable weld. The plastic connectors that the TIG gun connects to are not that strong and can be easily damaged so gentle handling is recommended. Similarly the shielding tips are not very secure so if you remove the shielding nozzle, the tips may come out. Don’t expect a lot of support from their customer service. Fortunately, there are a fair amount of Youtube videos that can assist you in the operation of this welder. The Everlast PowerMTS 251 SI is a versatile welding machine that offers incredible abilities. This is a very compact multi-process welder with pulse MIG/TIG features. 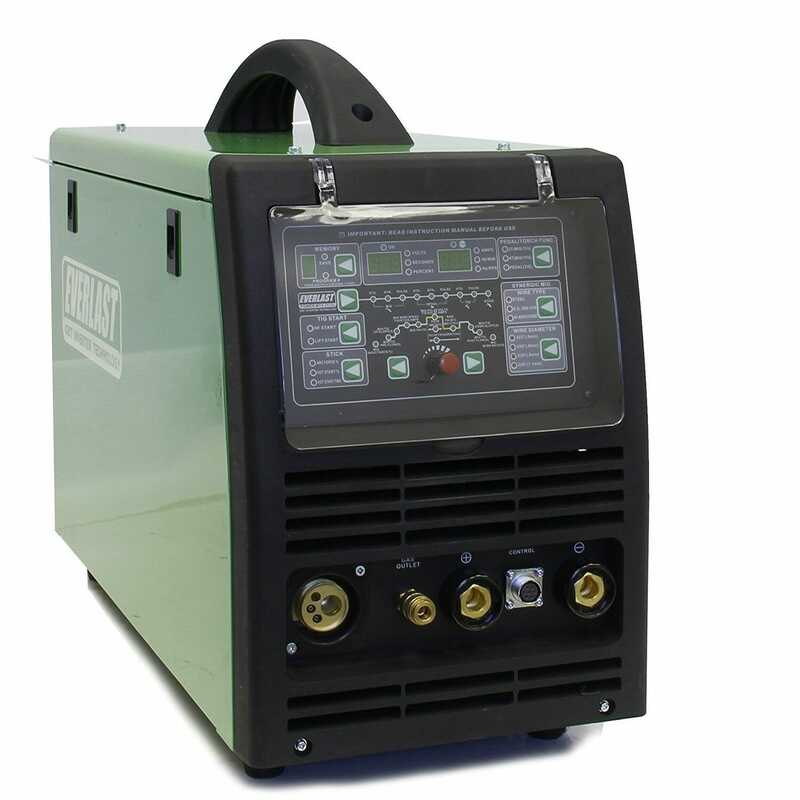 It is a digitally-controlled 3-in-1 inverter welding machine, capable of MIG, TIG and Stick welding. Everlast has included a unique Synergic MIG, Pulse MIG and Pulse TIG welding modes as well, which makes it easier to weld in overhead or difficult to reach positions. It weighs in at 80 pounds. This machine is a very easy machine to start and operate as it comes with a unique touchless, high-frequency start in MIG and stick modes and lift start in TIG mode. The Everlast Power MTS is a DC-only welding machine. There’s no welding reference chart so it is hard to know what settings to use for the different metal thicknesses you plan to weld. The operating instruction manual leaves a lot to be desired. It does not include much information about all the settings and ways to hook up the machine. This is a very compact light-duty multi-purpose welder. It’s a nice, quality all in one unit with a lot of versatility that even a beginner welder will be happy owning. This multi-process inverter machine is capable of MIG, Stick or TIG welding. It’s easy to switch processes and is made for use on basically any home or light-industrial application. It can run on 230 or 110 volts. It features a Euro-style disconnect and is Tweeco compatible. The torch has a 10’ lead and features built-in strain relief which extends the cable life. It comes with an adaptable plug for 230 or 110. This unit is so simple to operate and little to no setup is required as it is ready to weld straight out of the box. The machine’s duty cycle is only 20% at 190 amps, which limits it to smaller, lighter jobs. The Forney 324 is manufactured in Italy and the core section of the warranty lasts 5 years. There is also a 3-year warranty on the parts that are not the transformer, and there is a 1-year for all components and parts outside the battery charger and welder cover. However, if the machine is used for industrial purposes, that one year is reduced to 90 days. The Lincoln MIG 210 is a popular welding machine among small shop users and hobbyists due to its convenience, easy setup, and versatility. It can replace several machines in your shop because this one machine can give you the ability to weld in MIG, TIG, flux-core, and stick welding processes. This is a sturdy, versatile multi-purpose welder. Like most of the machines we review here, it can operate on both 120V and 220V, allowing it to take part in jobs that take a bit of finer precision and are a bit more touchy-feely. This is a lightweight machine, allowing easy portability and storage. It is sturdily constructed and built by one of the oldest names in the business, so you can count on it to last. It has push-and-turn digital controls and a color display screen which guide you through the setup process easily. Just plug it in, digitally set your settings and options and you are ready to start welding. 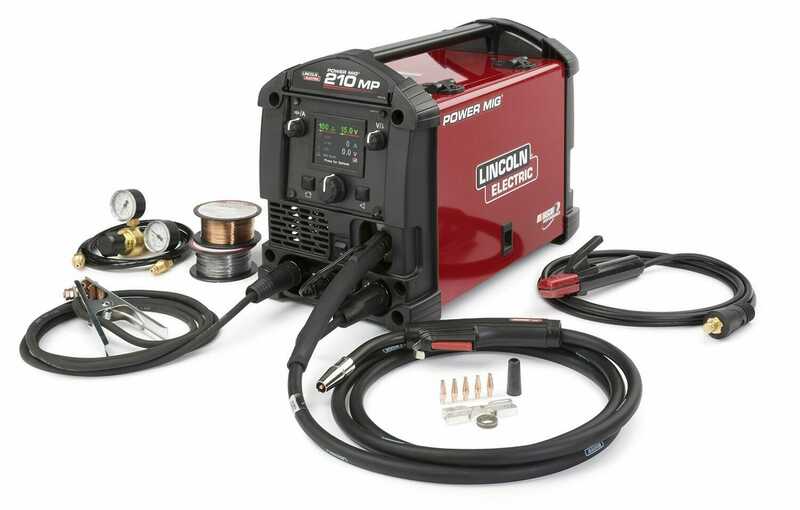 Don’t rely on the Lincoln 210 for TIG and stick welding jobs that require lots of power. The Lincoln 210 doesn’t really have the amount of power that you would need to produce exceptional welds for all materials. The welds produced may not match up to what you would get from a machine that is only designed for either TIG welding or Stick welding. Lincoln Electric offers a limited warranty on their welding, cutting tools and accessories against defects in workmanship and material. They will assume both the parts and labor expenses of correcting defects during the 3-year warranty period. The company has 30 service locations in the US. Lotos is the first company to offer a 3-in1 welding machine that allows the operator to TIG & Stick weld as well as plasma cut. 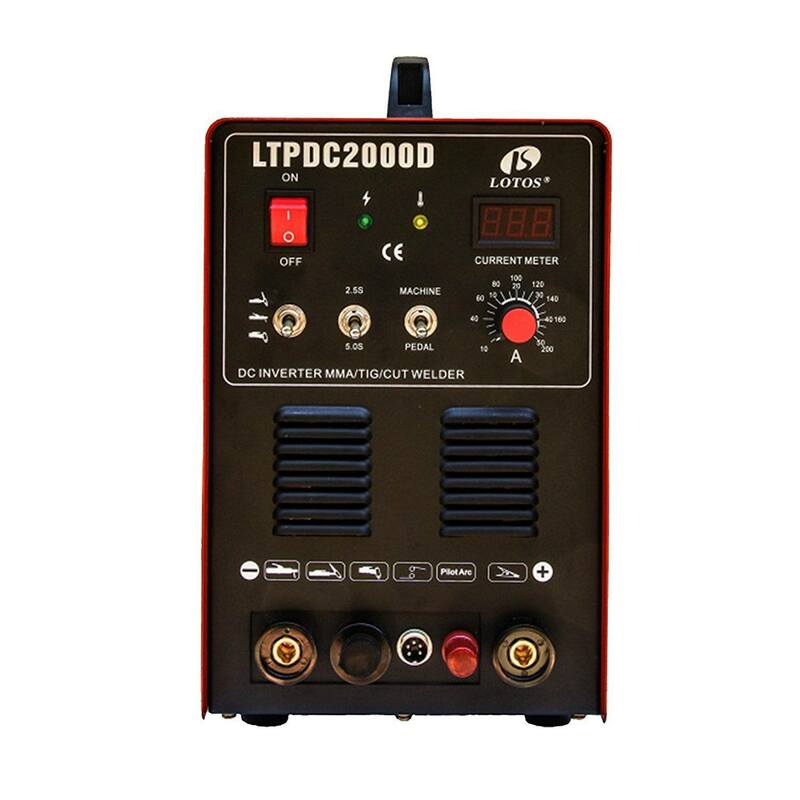 The LTPDC2000D welding machine is suited for welding shops and hobbyists alike. The Lotos LTPDC2000D welder is a 3-in-1 multi-process welding machine, which is capable of doing Plasma Arc Cutting, Stick or TIG welding. At 44.5 pounds, it is a portable unit. It is a dual voltage machine that runs on 220V/110V and dual frequency 50/60Hz. The TIG and Stick functions operate on DC only at up to 200 AMP. It is very easy to set up and tart with “Easy Arc Starting”. As a built-in safety feature, the Lotus Welder’s advanced circuitry protects against thermal overload. This machine can cut a variety of metals up to ½ inch, no matter what condition the metal is in, with the 50 amp pilot plasma-cutting function. The machine comes with a 30-day warranty that promises you 100% satisfaction or your money back. This gives you a chance to use the machine and see how you like it before committing to long-term use. There is an additional 1-year limited warranty included with your purchase. The 1-year warranty covers parts and labor for any manufacturer’s defects or issues you might experience with the machine. First, let’s go over the basics of a few types of welding. MIG welding uses a continuously-fed spool of wire and a MIG welding gun to weld together two pieces of metal. MIG is fairly simple to learn and very versatile. It can be used for a wide range of metal thicknesses and allows you to weld a variety of materials such as mild steel, nickel, stainless and aluminum. However, MIG welding has a high heat input and is not an ideal process to use for vertical or overhead welds or use with lighter metal alloys due to the possibility of melt-throughs. In addition, it can’t be performed on rusty materials and dirty materials, or in windy or rainy weather. The TIG welding process uses an electric torch with a tungsten electrode to deliver the current to the welding arc. A filler rod is hand-fed into the weld puddle, while the torch is held in the other hand. Both are protected and cooled by inert argon gas. TIG Welding is particularly useful for difficult-to-weld positions like overhead welding and is used mostly with thinner, light metal alloys. TIG welding is a more complex method to learn. A great deal of control and accuracy must be maintained in order to keep the arc the correct distance from the metal work pieces. Stick Welding works through a single electrode that also provides most of the welding material. The electrode, again, gets heated then melts, but the intense heat melts the work piece and welds the two parts together. The rod is also coated in flux, which creates a shield around the weld, protecting it from contamination. Stick welding creates exceptionally strong welds and can be used with very thick materials, even cast iron. Additionally, stick welding can be used for welding in unfavorable conditions, like heavy rain or strong wind. However, the heat generated while welding makes this style unusable for welding of thin materials because you will simply burn through the sheets. While no one welding machine can allow any welding operator at any skill level to handle every type of welding job on any type of materials imaginable, a multi-purpose welder (also known as a 3-in-1) comes as close as you can get. The biggest advantage of a multi-purpose welder is its versatility. It allows you to use the same welder as a powerful, industrial-grade welder that can handle heavy-duty welding jobs such as car frames, or a light-duty welder for welding around the house or hobby use. It gives a much broader range of jobs you can perform across a variety of metal types. Many multi-purpose welders are heavy, with some weighing in excess of 85 pounds. For an industrial workshop machine, this isn’t that bad. But for a home welder, this might be a bit of a problem. Some larger projects require a significant amount of repositioning of the machine to reach different angles. A heavy machine simply doesn’t give you the range of motion and reach you need to accomplish that. Its portability can be very limited. Also, multi-purpose machines rarely excel at all three welding types. While they’ll usually be strong in one area, they tend to suffer a bit in other areas. Like any piece of equipment you purchase, you want to get the best value for your money and have a welding machine that will last. When you are shopping around for a multipurpose welder, here are a few things to look for. 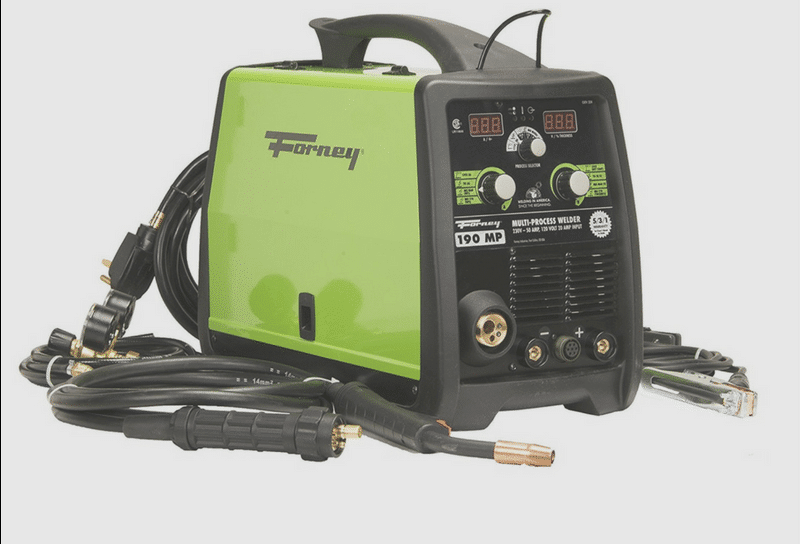 Make sure the multipurpose welding machine you are considering has enough amps of output power to handle the types of projects you will be using it to weld. A welding shop project will require much more output power than a home welder or hobbyist. You probably also want a machine that’s easy to set up and requires a minimum of instructions to operate. A complicated piece of welding equipment will just mean hours of time climbing the learning curve and the possibility that things can go wrong. Look for set-and-go weld control. Having to make a lot of adjustments to the settings in the middle of trying to run a weld bead is difficult to manage and you could end up with a sloppy weld. You need to decide the essential features that you absolutely must have in your multipurpose machine. More than likely, MIG welding will be one of the 3-in-1 methods. As such, you will want to make sure that the dealer or manufacturer offers a spool gun either as part of the welder or as an option to purchase separately in order to prevent wire feed jams. Another really nice feature if you get a machine with stick welding is arc control to keep the electrode from jumping.Be cautious about where the machine is manufactured and the support and warranty that is offered. If something on the machine goes wrong and you cannot get the part the machine needs at a parts shop, or there is not a location for that manufacturer or a dealer nearby or even in the US, you could end up paying a fortune in shipping fees to get the machine to the manufacturer in order to correct the defect. Where Can I Use This Machine? The MIG feature allows a welding operator to use this machine in a professional welding shop for industrial uses such as fixing farm equipment or working on car frames. The TIG welding features allow the user to create aesthetically-pleasing fine, artistic welds. The thin rod and the outstanding precision of the weld make this welding type very useful for sculpture, making and welds on motorbikes and car shells. The stick welding feature allows you to use this welding machine on heavy steel constructions, for heavy repairs and pipes, or on dirty or rusty materials. Welders come in many grades and price points that range from cheap to big bucks. However, not all welders can be used for every welding job. You can, however, come very close by purchasing a 3-in-1 or multi-process welding machine. For not much more than the price of a one-process machine, you can have the versatility of a machine that is capable of MIG, TIG and stick welding or TIG, stick and plasma cutting or some other combination. Any of the multi-process machines we’ve reviewed here will get the job done so it really depends on your price threshold and the features you consider essential.